The big news around here is that Eva is expecting a sibling next May! Right now I am 14 weeks, 4 days pregnant. As was the case with Eva, I wound up with horrible morning sickness that left me pretty much unable to do anything but barf and lay in the shower. Good times! As such, I haven’t been doing much crafting, gardening, or cooking. I’m just starting to get back on the horse, though, and hopefully I’ll be able to share some new things with you soon! Not one, but two (!!) four leaf clovers! Luck is coming my way! 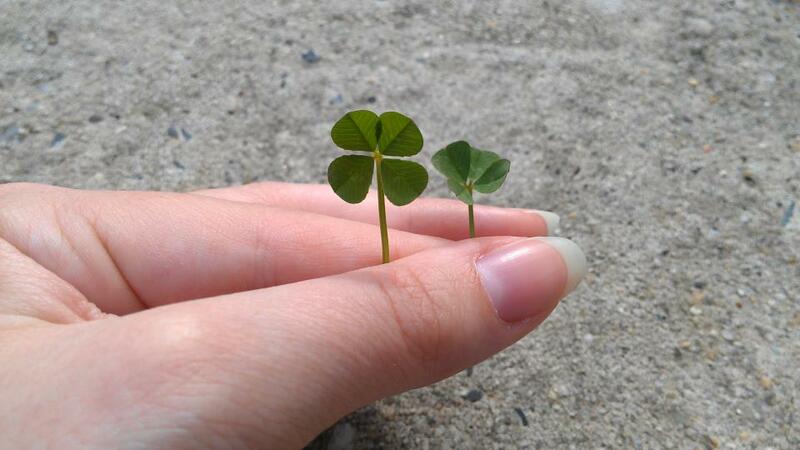 I found these clovers while sitting in the back yard with Eva. We have a ton of clover (weeds), so every time I’m close to the ground, I scan for four leaf ones. I’ve never found one before today. 🙂 I hope that finding these means something good is in our future!